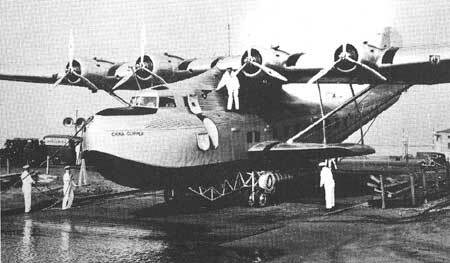 The famous Pan Am Clippers brought Guam on-line with the world with their regular weekly stop-overs. U.S. Ambassador to Japan Joseph C. Grew warned the State Department that the Japanese might "attempt a surprise attack on Pearl Harbor, using all their military facilities." President Franklin D. Roosevelt issued Executive Order No. 8683 establishing "security clearance" programs in Guam and American Samoa. The order stated, in part: "The territorial waters between the high water marks and the three-mile marine boundaries surrounding the islands of Rose, Tutuila and Guam, in the Pacific Ocean, are hereby established and reserved as Naval Defense Sea Areas for purposes of national defense . . . and the airspaces over the said territorial waters and islands are hereby set apart and reserved as Naval Airspaces Reservations for the purpose of national defense. . ."
Annual observance of "Flag Day" held. Program included the singing of the following songs by school children: "Pledge to the Flag," "I Love My Country And My Flag," "Flag of the Free," and "God Bless America." Advertisements in the monthly Guam Recorder included those of Pan American World Airways, which claimed that "By Air Express, the Philippines are only one day away, China or Hawaii two days, the United States three days," adding: "Let us help you give wings to your business;" the Gaity Theatre (Home of Good Pictures) offering the following attractions: "The Ramparts We Watch," "Boom Town," "Bad Man of Wyoming," and "City of Conquest." The Agana Theatre, on the other hand, offered late releases from Paramount, 20th Century Fox and Republic Pictures. Limtiaco's Taxi Service was "always open, always on time," just phone 108-R; and competitor Bordallo's Taxi Service was "at your service day and nightcourteous chauffers." Mrs. K. Sawada offered all kinds of beer, including Pabst, Lucky Lager, Burgermeister, Eureka, Pilsengold, and San Diego Quality. She also sold California wines and Schenley's Old Quaker rye whiskey. Naval Station announced plans for the construction of a new officers' quarters at an estimated cost of $277,000. Guam Militia Carnival Queen and entourage at annual festival. The United States and Japan commenced negotiations in Washington, D.C., the purpose of which was an attempt to avoid war in Asia and the Pacific. Admiral Chester Nimitz, chief of the Bureau of Navigation, recommended to the Chief of Naval Operations that the Guam Insular Force be increased by "20 men in various ratings in the Insular Force assigned to the Naval Station," and an additional "100 men to provide for essential security details of the island." Guam Militia Carnival was held at Bradley Park in Anigua. 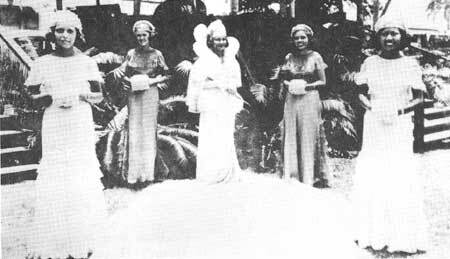 Highlight of the carnival was the crowning of the carnival queen, Miss Rosario Baza Sayama, by Naval Governor George McMillin. 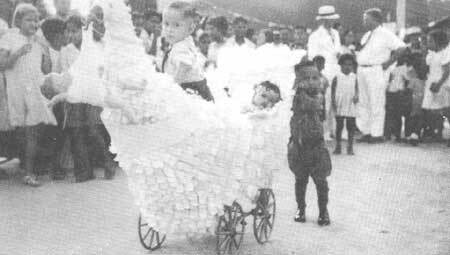 A baby float parade also was held in conjunction with the carnival. Deemed healthiest baby was the daughter of Mr. and Mrs. Ben Calvo. The cutest was the daughter of Mr. and Mrs. John Underwood. President Roosevelt announced that a large cruiser being built at a New York shipyard will be named "USS Guam." Author Tony Palomo pushes younger brothers Eddie and Benigno in the annual Baby Float Parade. Naval Governor McMillin reported to the Chief of Naval Operations that two unknown aircraft were sighted over Guamon March 20 and again on March 21. The planes turned out to be Japanese aircraft and the Japanese foreign ministry eventually apologized for the airspace transgression. Authority was received from the Navy Department to increase the Guam Insular Force complement from 110 to 234. Enrollment in Guam's schools totaled 4,775, of which 4,384 were in the elementary grades and 391 in high school. Graduates during the year were 297 from the elementary schools, 52 in junior high, and 23 in senior high school. Valedictorian among the senior high school graduates was Elizabeth de Leon Flores, and among junior high schoolers, Segundo C. Aguon. Salutatorians were Thomas J. Johnston and Antonia de Leon Flores, respectively. The Insular Force was originally organized in 1901 with nine members. Oscar Lujan Calvo was ordained a Catholic priest. He was the third Chamorro to receive Holy Orders, the previous being Padre Jose Palomo and Father Jesus Baza Duenas. Elections were held to fill seats in Guam's House of Council and House of Assembly. The Congress was an advisory body whose authority was limited to making recommendations to the naval governor. Elected to the House of Assembly in 1941 were the following from Agana: Pedro T. Toves, Jose V. Aguon, Felix M. Camacho, Jose D. Leon Guerrero, Jose (Chala) Cruz, Eduardo T. Calvo, Joaquin L. Flores, Vicente Rosario, Jose C. Torres, Trinidad T. Calvo, Juan P Sablan and Francisco D. Perez. From outlying districts were Manuel T. Charfauros, Merizo; Jesus S. Quinata, Umatac; Jesus D. Paulino, Inarajan; Enrique S. San Nicolas, Talofofo; Jose B. Cepeda, Yona; Juan O. San Miguel, Sinajana; Juan C. Pereda, Barrigada; Josc C. Torres, Yigo; Francisco R. Castro, Machanao Manuel S. Rojas, Asan; Pedro C. Santos, Piti; Antonio Won Pat, and Felix T. Dydasco, Sumay; and Jose S. Rivera, Agat. Elected to the House of Council from outlying districts were Gaily R. Kamminga, Piti; Juan C. Lizama, Sumay; Francisco Q Sanchez, Umatac; Enemesio S.N. Diego, Inarajan; Vicente M. Flores, Barrigada and Jose D. Perez, Yigo. 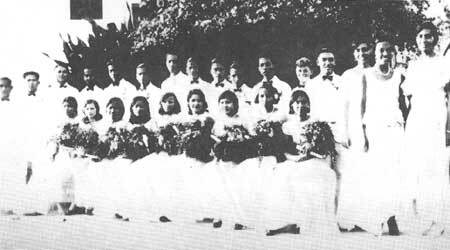 A pre-war class of high school graduates. Island-wide tuberculosis survey was conducted by Dr. Ramon Sablan, Guam's first local physician. U.S. Congress appropriated $7 million for naval improvements in Guam, principally improvements to the harbor. President Roosevelt and British Prime Minister Winston Churchill agreed on a plan (ABC-1) to concentrate American and British efforts against Germany and a holding operation in the Pacific and Asia. They approved a strategic triangle concept embracing Alaska to the north, Hawaii to the west, and Panama to the south, committing their forces to defending all points within the triangle. Ernest Hemingway, American author, visited Guam while enroute to Cuba from Hong Kong. Shortly thereafter, Henry Luce, co-founder of Time and Life magazines, and his wife, Clare Booth Luce, stopped by Guam while enroute to the United States after a visit to China. Guam Insular Force was re-organized. The first enlistees reported for duty and training April 10. The Insular Force was originally organized in 1901 with nine members. The number increased to about 30 by 1908 and to more than 100 by 1917. During World War I, many of these men transferred to the regular Navy. Pan American Airways commenced recruiting workers to work at airport facilities at Wake, Midway and Canton islands. U.S. Congress approved Lend-Lease bill authorizing direct U.S. arms aid to Great Britain in fight against Germany. 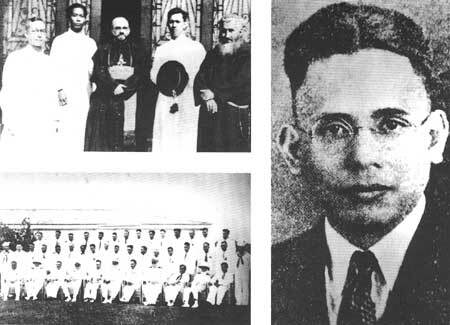 (top, left) Spanish Bishop Olano and Padre Roman with Chamorro priests, from left: Fathers Jesus Baza Duenas, Jose Manibusan, Bishop Olano, Father Oscar Calvo and Padre Roman. 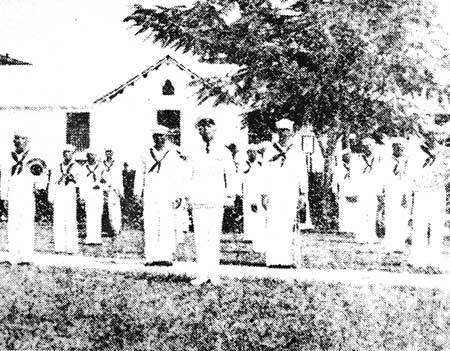 (bottom, left) Members of the Guam Congress at the Congress Building with Navy officials. Their authority was limited to making recommendations to the naval governor. (right) Dr. Ramon Sablan, Guam's first physician, composed the Guam Hymn. Japanese government had expended $7 million for the fortification of Saipan, Tinian and Pagan, the amount being part of $28 million spent throughout mandated islands. Governor McMillin urged the Chief of Naval Operations to have all military dependents evacuated "immediately . . . because of international situation in this area." German forces invaded the Soviet Union. U.S. commenced moving armaments to the Philippines. Japanese war plans to seize Southeast Asia was completed (Operation No.1). Secretary of the Navy Frank Knox approved plans for the Navy to furnish transportation to four American Capuchin missionaries bound for Guam. They were Fathers Alvin Lafeir, Mel McCormack, Arnold Bendowski, and Brother Gabriel Badalamenti. New public school was completed in Merizo. a. Total population was 23,394, of which 21,994 were Chamorros, 812 were non-Chamorros, and 588 represented the naval colony. "Operation Z" included simultaneous invasions of Malaya, the Philippines, Wake, Guam, Borneo and Java. b. Naval Station personnel included 210 Insular Force, 47 attached to USS Penguin, 137 assigned to USS Gold Star, 54 attached to Naval Hospital, 61 assigned to Naval Station, and 21 attached to the Naval Radio Station. c. A total of 150 local men enlisted as mess attendants during the fiscal year. The number increased the total Chamorro mess attendants to 628. The Bureau of Navigation had authorized a maximum of 700 Chamorros in the mess attendant branch of the Navy. d. Capital improvement projects completed during the fiscal year included the Almagosa water system at a cost of $260,000; site preparation for the construction of a 25,000-barrel fuel oil tank; four fuel tanks owned by Standard Oil of California; and two fuel tanks owned by Pan American Airways. As of June, the island was still recovering from a major typhoon which struck the island on November 3, 1940. Maximum winds was estimated at 93 knots per hour with gusts exceeding 110 knots per hour. The American Red Cross donated $10,000 in assistance to the civilian population. USS Penguin returned from the Philippines where the vessel underwent an overhaul. The Navy Band was composed entirely of local Navy men. Japanese troops moved further into French Indochina. The United States responded by ordering a freeze on all Japanese assets in the United States. During the previous year, Japanese troops moved into French Indochina without resistance by the Vichy government. President Roosevelt then imposed an embargo against Japan, prohibiting the exportation of such commodities as gasoline, copper, scrap iron and steel. Douglas MacArthur was recalled to active duty as an Army major general to mobilize the Philippine army. Ten million dollars was allocated for the purpose. In 1941, 137 of Guam's Naval Station personnel were assigned to the U.S.S. Gold Star. On December 7th, Guam's station ship was in the Philippines on a Christmas buying spree. A summit meeting between President Roosevelt and Prince Fumimaro Konoye, Japanese prime minister, was proposed to help ease tension between the two countries. Nine B-17s flew from Hawaii to the Philippines. This was beginning of planned air armada in the Philippines. Governor McMillin received the following message from Admiral R.E. Ingersoll, chief of naval operations: "Continuation of modified naval censorship desired . . . for civilian population will be held in abeyance pending procurement of personnel here for that purpose. Qualified men difficult to obtain. However, a request has been made for them but failing in this, it may be necessary for you to select part or all of such censors from your command. Statement by air mail of your exact problem in this regard will be helpful in planning at this end." Pete Lobanos whipped Justo White in a six-round boxing match and flyweight champ Joe Quenga retained his crown by out-punching "Tiny" Joe Joe in a four-rounder. A typhoon struck Guam but damages were minimal. 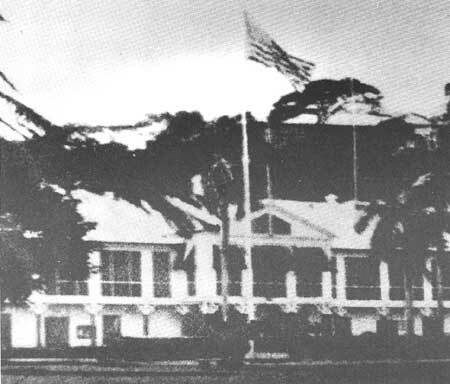 American flag flies above the Governors Palace in pre-war Agana. Japanese Admiral Isoroku Yamamoto's strategic plan for the attack on Pearl Harbor was completed. 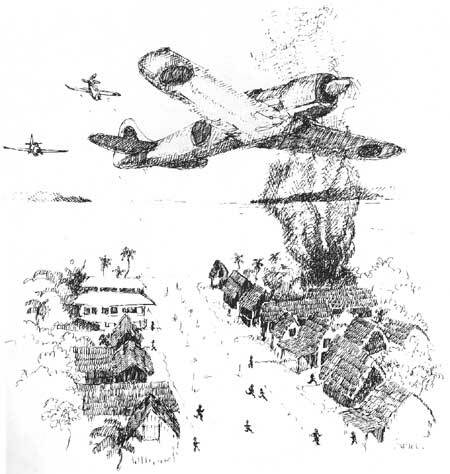 "Operation Z" included simultaneous invasions of Malaya, the Philippines, Wake, Guam, Borneo and Java. Pan American World Airways airport manager C.F. Gregg sent a letter to Governor McMillin expressing his appreciation for assistance rendered in repairing the Honolulu Clipper, which ran aground at Apra Harbor on August 17. Message sent from Tokyo to all Japanese naval fleet commanders: "As condition becomes more and more critical, each and every ship (and unit) will aim at being fully prepared for commencing war operations by the first part of November. Individual ships (and units) will speed up battle preparations while carrying out all scheduled drills and training to the fullest extent so as to achieve maximum fighting power and to enable them to perform their duties to perfection." (left) Juan (Camacho) San Nicolas, Police Force, 1938. 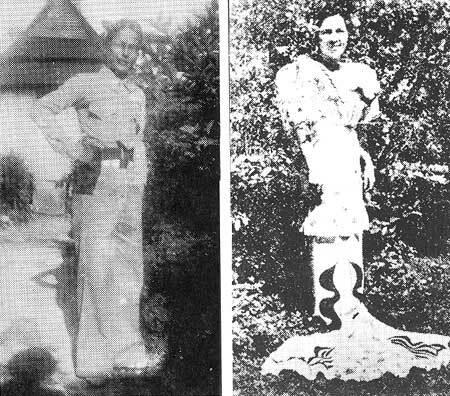 (right) Miss Mariana Leon Guerrero who later married Manual U. Lujan, a charter member of the Guam Legislature. A total of 104 American military and civilian dependents were evacuated from Guam to Hawaii and the West Coast. Dependents included three wives and two children of PAA employees, and the wife of the Atkins-Kroll Co. manager. Prime Minister Konoye's cabinet fell; Army General Hideki Tojo took over as prime minister. This dispatch is to be considered a war warning. U.S. Naval General Board recommended against fortifying Guam. In report to the Secretary of the Navy, dated October 23, 1941, the Board in part: " . . . the development and fortification of Guam would take many years before it could reach full effect; meanwhile, the island would be open to threat, subject to unpredictable events, a source of weakness while uncompleted, a source of irritation and growing fear to the Japanese, and a potential asset to them if taken from us at an intermediate stage of its development . . . if it is hoped to bring the present negotiations with Japan to a satisfactory conclusion it would be inadvisable, during their continuance to present to the Congress estimates for the development and fortification of Guam as an air and submarine base . . . under present conditions the vital interests of the United States in the Western Hemisphere and the Atlantic are seriously threatened, and it appears that all available material resources will be required to meet the commitments of the lend-lease, the defense program and essential domestic needs . . . the interests of the United States in the Pacific east of Guam can be defended without the military development of Guam and such development at this time might bring on a war in the Pacific which the United States should seek to avoid until the situation in the Atlantic is materially improved . . . The General Board recommends that (a) Guam be not fortified under present circumstances; (b) the current harbor development be continued to completion; (c) Guam be not developed as a naval base, but that plans be prepared and kept up to date for its development as a fully fortified air and submarine base." Japan government set end of October as deadline for reaching agreement with the United States. War alert was flashed to all U.S. Pacific bases: "Best intelligence suggests Japan might attack Russia or British or Dutch colonies within East Indies." The first Japanese planes attacked Guam at Sumay at 8:27 a.m. on December 8, 1941. Carmen Babauta, a Sumay resident who had a new baby, remembers the panic in the village. "People were crying, running. My husband ran to the house and yelled at me from outside to grab the baby and run toward the church. We all tried to some place to hide. You could hear the thatch and tin roofs ripping and rattling all around. Everyone was crying and scared. We got together on the back side of the church and hid there. We couldn't believe this was happening to our village, to our peaceful island." Another eyewitness, Jesus C. Lizama adds, "We thought it was the end of the world." Ambassador Grew reminded State Department that failure to reach an agreement with Japan could result in "all out do-or-die attempt actually risking national Hara-Kiri to make Japan impervious to economic embargoes rather than yield to foreign pressure." Tokyo ordered Consul Kita in Honolulu to make "ships in harbor" report twice weekly. Japanese special envoy Saburo Kurusu stopped overnight in Guam while enroute to Washington for peace talks. He spent the night at the PanAm Hotel at Sumay. Secretary of State Cordell Hull issued four-point demand to Japanese government, to wit: (1) Withdraw from China, (2) withdraw from French Indochina, (3) renounce Tripartite agreement with Germany and Italy, and (4) honor the territorial integrity of China and other countries. President Roosevelt informed his cabinet that "we are likely to be attacked next Monday (late November) for the Japs are notorious for attacking without warning." He cabled Churchill: "We must all prepare for real trouble, possibly soon." Emperor Hirohito approved plan for attack on Pearl Harbor. Washington sent alert radioed to all commands: "negotiations with Japan appear terminated . . . Japanese future action unpredictable but hostile action possible at any moment. If hostilities cannot repeat cannot be avoided the United States desires Japan commit the first act". Japanese fleet, under Admiral Chuichi Nagumo, set sail for Pearl Harbor from Hitokappu Bay, Japan November 27). A war warning was issued by Washington officials to all military commanders. The message read: "This dispatch is to be considered a war warning. Negotiations with Japan looking toward stabilization of conditions in the Pacific have ceased and an aggressive move by Japan is expected within the next few days. The number and equipment of Japanese troops and the organization of naval task forces indicate an amphibious expedition against either the Philippines, Thai or Kra peninsula or possibly Borneo. Execute an appropriate defensive deployment preparatory to carrying out tasks assigned in WPL 46. Inform District and Army authorities. A similar warning is being sent by War Department. Spenavo (Special Naval Observer in London) inform British. Continental districts Guam, Samoa directed to take appropriate measures against sabotage." Japanese Ambassador to Germany Oshima reported that German Foreign Minister Ribbentrop had pledged: "Should Japan become engaged in a war against the United States, Germany of course, would join the war immediately." Prime Minister Tojo advised his cabinet and the Imperial General Headquarters that there was no alternative but war, or "we'll lose our chance to fight." Among those who defended Guam against the Japanese ground force were Insular Force Guardsmen Pedro G. Cruz (center) and Vicente C. Chargualaf (right). The two men manned a machine gun on the northeast corner of the Plaza de Espana, at the cathedral. They were joined at the last minute by a frightened t 8-year-old boy, Roman E. Camacho who, defiant of orders for civilians to stay home, had wanted to photograph events at the plaza. As Cruz manned the machine gun, Camacho helped change the ammunition carriage and Chargualaf covered them with a .45-caliber pistol. However, during this valiant effort Chargualaf and Camacho were killed. Cruz is among the surviving members of those who participated in the defense of Guam fifty years ago. Japanese Imperial Council approved plans to wage war against United States, Great Britain and Netherlands. Message from Tokyo to Combined Naval Fleet: "This despatch is top secret. This order is effective at 1730 on 2 December: Combined Fleet Serial #10. Climb Niitakayama 1208, repeat 1208!" Governor McMillin ordered to destroy all classified materials. Those to be destroyed were "all secret and confidential publications and other classified matter except that essential for current purposes and special intelligence." Japanese fleet commenced attack on Pearl Harbor at 8 a.m. (4 a.m. Guam time, December 8). Seven Guamanian navymen were killed when the USS ARIZONA was sunk. Message (secret instruction) from commander of South Seas Force to all under his command: "A special message on the occasion of the Declaration of War to all under my command. The critical time, which calls for your putting your strength to the supreme test and for you to prove your unequalled loyalty to the throne, has at last arrived. Operational plans have been perfected, all preparations have been completed, every officer shall reassure himself on being thoroughly acquainted with every phase of the previously issued instructions, fighting spirit must soar and strict alert maintained in order to successfully carry out our plans. Take the initiative against the enemy and be on your guard against attack from the enemy. Obtain control and completely crush them by maintaining the closest of cooperation between forces. Upon meeting the enemy, desperate strategy must be applied, if it is found that contrary to your expectations, advancing on or holding your line against the enemy is difficult. Although giving one's life may be the means by which to pave the road to victory, remember that final victory is achieved by those possessing the spirit of endurance to fight through to the finish. It is strongly felt that in addition to the operations of this force being very wide and varied, reaching into many channels, the extent of success of each operation not only directly affects the Combined fleet's operations, but will in the end have its effect on the whole outcome of the war. Advance to strike, hold your own on guard but in complete unity under the supreme command, always act in accordance with your deep loyalty to the Imperial Throne, be a perfect soldier first, accomplish your duty and deprive yourself, thus earn the right to glory in victory." Guam's military contingent was comprised of 274 navymen, the 153 Marines and 242 Insular Force members. Their weaponry included three Lewis machine guns, four Thompson submachine guns, six Browning automatic pistols, fifty .30-caliber pistols, a dozen .22-caliber regulation rifles, and 85 Springfield rifles. Message from Emperor Hirohito to commander of Combined fleet: "I, the Emperor, on the occasion of ordering the expedition, leave the matter up to you, as commander in chief of the Combined Fleet. The responsibility of the Combined Fleet is indeed a great one as the entire rise or fall of our nation rests on its success or failure. You, the Commander in Chief, must prove my trust by summoning all your resources, acquired during the many years of training of our fleet towards advancing on the enemy to annihilate it, and to prove to the whole world the greatness of our forces." Message to units assigned to attack and seize Guam: "No units other than those within your detachment have been issued the strategical charts for "Oomiyajima." Exercise caution in its use." (Note: "Omiyajima" was name given Guam by the Japanese). 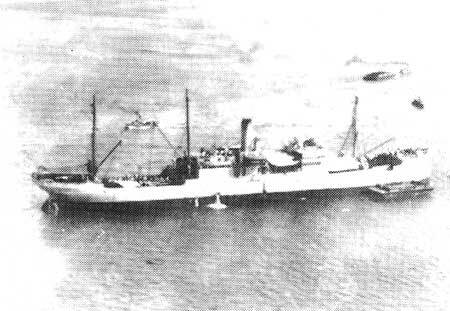 USS Gold Star, Guam's station ship, was ordered by Asiatic fleet to delay its departure for Guam "because of the international situation." The Gold Star was in the Philippines on a buying spree for the coming Christmas. Japanese fleet commenced attack on Pearl Harbor at 8 a.m. (4 a.m. Guam time, December 8). Seven Guamanian navymen were killed when the USS Arizona was sunk. They were Gregorio S.N. Aguon, Nicolas S. Fergurgur, Francisco Reyes Mafnas, Vicente Gogue Meno, Jose Sanchez Quinata, Francisco U. Rivera, and Filomeno Santos. 0445Governor McMillin received flash alert from Asiatic Fleet that Japanese fleet had attacked Pearl Harbor. 0800Thousands of island residents attended Catholic Mass in observance of the annual feast of the Immaculate Conception. 0815Nine Japanese planes flew over Agana from the east and heading towards Orote Peninsula where the Marine Barracks, Pan American Hotel, fuel tanks were located. The planes came from Saipan, 145 miles north of Guam. 0827First bombs fell. PanAm Hotel kitchen suffered direct hit, killing Larry Lujan Pangelinan and Teddy Pores Cruz, young kitchen workers. Fuel tank struck. After attack at Sumay, attacking aircraft bombed and strafed Piti Navy Yard and then pursued USS Penguin off Orote Point, strafing surveillance vessel and killing Ensign Robert White and injurying many crewmembers. Penguin crew scuttled the ship. Japanese planes made bombing runs throughout the day, bombing and strafing selected targets, including radio station at Libugon. Most Agana residents fled from the city by nightfall. Governor McMillin ordered the arrest and detention of all Japanese nationals. Those seized were confined at the Agana jail. McMillin consulted with his military officers on plans to defend the island, and with civilian leaders, including Pedro Martinez, who inquired whether he should destroy his ice plant, thus denying the Japanese use of the facility. McMillin told him the ice plant had no strategic value, adding: "Pedro, during a war, the most important consideration is survival. You have a large family and your prime obligation is to take steps to insure their survival. I am finished as far as this war is concerned but we will defeat the Japanese. The Americans will come. My advice to you, Pedro, is let the Americans fight the Japanese." 1700Japanese planes returned to Saipan. 0830Japanese planes returned, bombed and strafed selected targets throughout island. Three of eight Saipanese infiltrators were apprehended and confined at the Agana jail. The infiltrators had sneaked into the island at Ritidian Point the night before. By this time, Agana and Sumay were virtual ghost towns. 0100Guam military defenders were deployed, the bulk of the 153 Marine contingent at Orote, and the Insular Force, navy personnel and a handful of Marines in Agana. Guam's military contingent was comprised of 274 navymen, the 153 Marines and 120 Insular Force guardsmen. Their weaponry included three machineguns, four Thompson submachine guns, six Browning automatic pistols, fifty .30-caliber pistols, a dozen .22-caliber regulation rifles, and 85 Springfield rifleswhich meant some of the military personnel were without arms. The Japanese attack force included the South Seas Detachment, a unit of about 5,500 army troops under the command of Major General Tomitara Hori, and a special Navy land force of about 400 men drawn from the 5th Defense Force stationed in Saipan. 0330Special Japanese naval force landed at Apurguan, about a mile east of Agana. A sedan converted into a jitney and carrying 17 members of the Limtiaco family of Piti and enroute to Yigo was attacked. Thirteen of the 17 perished. Others who were found along the way to Agana were killed. After a torrid exchange of fire, the honking of a horn signaled cease fire and retreat. A Japanese officer shouted across the Plaza from the Agana Cathedral area: "Your captain. You come out. Surrender." 0400Governor McMillin received report that flares were seen at the East Agana-Tamuning area. Most of the island's military personnel in Agana were deployed at the Plaza de Espana. Heading the Plaza defenders was Robert Bruce Lane, chief boatswainmate and the Insular Guard's training officer. 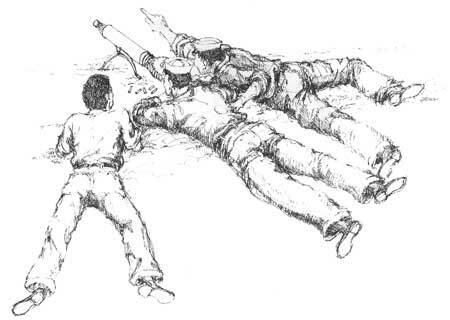 The three machine guns were assigned to Guardsmen Pedro (Pedang) Cruz, Juan (Camudo) San Nicolas and Jose (Pedron-Medo) Perez. 0500Special Japanese force reached the Plaza area. After a torrid exchange of fire, the honking of a horn signaled cease fire and retreat. A Japanese officer shouted across the Plaza from the Agana Cathedral area: "Your captain. You come out. Surrender." Governor McMillin directed ander Giles and Chief Lane to approach the Japanese troops. They were marched through the San Antonio district and made contact with the commander of the Japanese navy landing force. They returned to the Plaza half an hour later, accompanied by the Japanese commander, Hayashi. Said Governor McMillin:"The leader of the squad of Japanese who entered my quarters required me to remove my coat and trousers before marching me into the Plaza, where officers and men were being assembled, covered by machine guns." Among casualties at the Plaza were Angel Flores, Vicente Chargualaf, Roman Camacho, John Kauffman, J. Kleugel, Malvern Smoot, and Jesus Cruz. 0700Governor McMillin surrendered the island to the Japanese, the first American territory to fall into enemy hands. 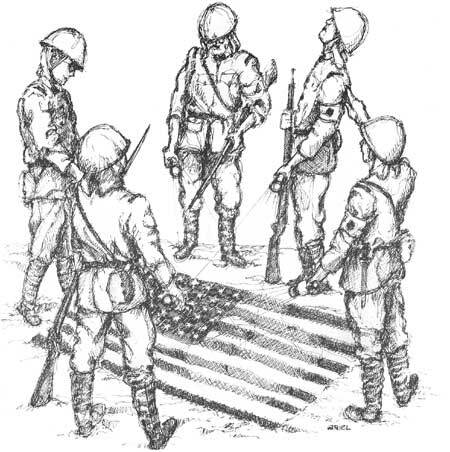 After they were lined up on the plaza facing the palace one of the Insular Guardsmen Pedro G. Cruz recalls that he and the other captives were surprised to see the Japanese with an American flag. "A group of Japanese spread the American flag on the ground in front of us and shined flashlights on it. It is my opinion that this was a signal to the planes flying overhead. To me, this is when Guam surrendered." Information obtained for the development of this sequential listing of events came from various sources, including the following: Navy files. Military Section. National Archives (particularly those relating to intercepted Japanese messages); Library of Congress, Washington. D.C.; Micronesia Area Research Center, University of Guam: Nieves M. Flores Memorial Public Library. Agana: National Park Service; Guam Recorder, Naval Governor George McMillin's report to Secretary of the Navy; The Pacific War by John Costello; "And I Was There" by Rear Admiral Edwin Layton; Turbulent Era by Joseph C. Grew: Japan's Decision for War: Records of the 1941 Policy Conferences by Nobutaka Ike; The Pacific Rivals by the staff of the Asahi Shimbun; the Naval Governor's annual report for fiscal year 1941. and An Island in Agony by Tony Palomo.